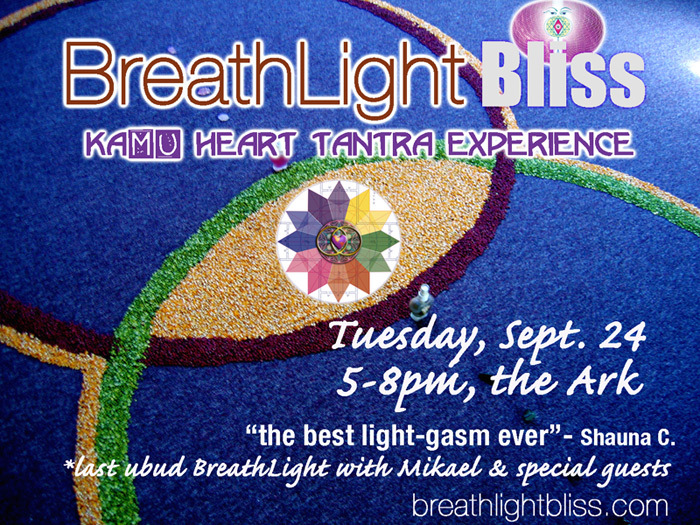 BreathLight Bliss – KA-MU Heart Tantra Experience with Mikael & Special Guests! 200,000 IR heart exchange at the door. Where: The ARK is in Jungjungan, just north of Ubud. Take a left into the driveway that is exactly 900 meters north of the Botanical Gardens (to get to the Botanical Gardens road, start from Bali Buddha and go right onto the main road. Take the first left. It is called Jalan Tirta Tawar. There is a sign for the Botanical Gardens at the intersection). There are two umbul-umbuls (flags) –one orange and one yellow- at our driveway. Proceed to the second house on this driveway. 1) It’s the second left after the black and white sign that says Deta Jungjungan Rice Field Villa. 2) Just before the driveway, about ten feet of the shoulder of the main road has fallen away on the left. 3) Opposite the driveway on the right of the main road, there is a low white building. 4) If you get to the Villa Jungjungan, you’ve gone about 100 meters too far.